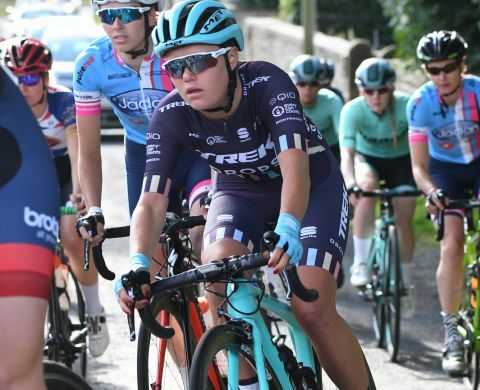 Young British rider, Abby Mae Parkinson is heading into her fourth season as a senior on the road and said in a chat with VeloUK, that being a racing cyclist is an amazing career and one she doesn’t intend to give up anytime soon. Based in Nice, Abby-Mae’s season starts at the end of February after a training camp with her team Drops. It will be her third season with the British team and one she’s excited to get started. Abby –Mae describes the team as being a group of friends. “It’s not like I’m going to work at a team camp and more like I’m going to see my friends. There is a serious side as well but it is such a nice environment as you’re made to feel so welcome. It’s a pleasure to go away with the girls”. Looking back at her career so far, the highlights says Abby-Mae include winning the Best Young rider jersey in Setmana Ciclista Valencia in 2018 and then going to Strade Bianche (Women’s World Tour) and finishing 22nd. “That gave me a taste of when I put my mind to it, I can do quite well and I take a lot of motivation from that”. “I am now pretty comfortable on the gravel which helps in places like the descents and that’s one less thing to stress about”. 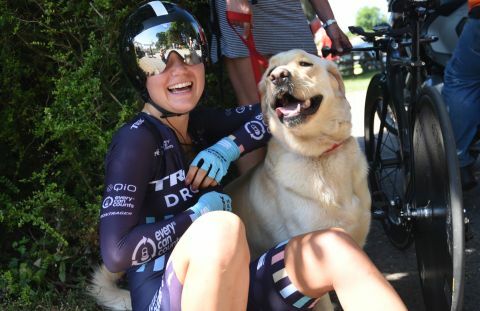 Asked how it feels being in the pro peloton surrounded by the stars of the sport and whether she’s over that, Abby-Mae replies “no, I don’t think so. I think you are always in awe of the girls who are winning races because you want to be like them. I am used to it but you still pay them a lot of respect”. Abby-Mae’s favourite races are the same as so many in the sport, the Spring Classics. “Oh, I love racing the Tour of Flanders. The crowds are incredible, it’s an epic crowd and no matter how the legs are hurting, the crowd is cheering you on and it’s exciting racing. I really love that one and it’s a stand out race for me”. And races that suit her …. “hopefully the Women’s Tour will suit me this year with it being a bit longer. I don’t know the route this year but that race is for sure a target for me. Last year I was second best British rider behind Dani Rowe (now retired) so hopefully can move up there. The tour of Yorkshire as well is a target being a home race”. 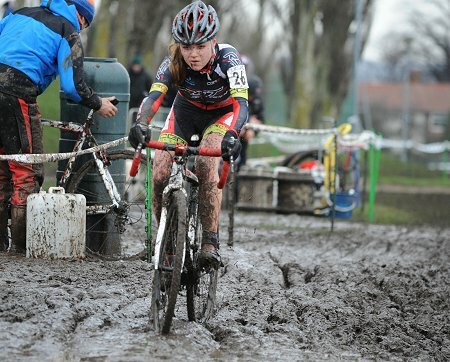 Young riders in the sport generally find themselves in a domestique role and it is no different for Abby-Mae who has loved that part of the racing. “We haven’t yet been together as a team and to find out our strengths and weaknesses as a group. We’re all young and I won’t know my role until we’ve ridden together. “Working for one or the other; Tayler Wiles and Eva Buurman, sometimes I’d be the last one there with them which is exciting, looking after them and making sure they had bottles and so on. That is a learning experience for sure”. From travel to training, the rider mentioned earlier, Olympic champion Dani Rowe (Nee King), is now her coach says Abby-Mae. “Training is going really well after getting my new coach who has been coaching me since November. I’m training harder than I ever have and been doing a lot of new sessions and focusing on areas of my riding that I need to work on so I am pretty excited about what the results will be”. Looking ahead to this season, Abby-Mae is hoping the team gets a ride in the Classics. “I love them all and they my favourite races. With the Worlds being in Yorkshire and on a classics type course, it would be nice to get in the classics and prove I am worthy of a place in GB for the worlds”. Good luck to Abby-Mae in 2019!